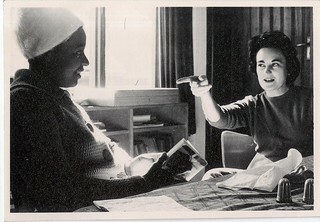 The Ruth First Papers are the collected notes and writings of Ruth First, activist, campaigning journalist and scholar. The project aims to create and populate a digital archive of a selection of Ruth First’s writings held at the ICwS and in partner collections. The resource as a whole will represent a digital version of the Ruth First Resource Centre that was called for in the immediate aftermath of her assassination. If you’re a researcher interested in using the Ruth First Papers collection for your work, or a teacher planning to use our material in a class, don’t hesitate to contact us to find out what new material will be released soon, or where you might find specific files. Ask us about the archive. Browse and explore the Ruth First Papers. Read more about the project and the team. Read our latest news articles and blog posts. Use a free text search to find items in the collection. You can help the Ruth First papers project to raise awareness about the life and work of Ruth First. We rely on small funds and donations to carry out our digitisation work. With just £100 we can release 50 more pages of material to inspire academics and activists with Ruth First’s work. A small donation will be part of bringing a fantastic resource for African history, politics and activism to a new generation. Find out more about our supporters here.